At a time when cinephilia and film criticism seem to have their standards burdened by urgent social demands – the critical rehabilitation of a filmmaker such as Ken Loach via I, Daniel Blake being a flagrant example (among many others) of the popular demand for a “political art” that confirms rather than questions the spectator’s moral comfort – the AFA presented one (of many) eloquent counterpoint with the rare screening of one of Stan Brakhage’s lesser-known feature masterpieces: Song 23: 23rd Psalm Branch (1968) – sadly, the only screening of the series I could attend. 23rd Psalm Branch articulates the formal principle of dissension – the word that Jacques Rancière would later establish as the principle of politics in an order established by a consensus: “the political is what disturbs this order by introducing either a supplement or a lack.” It is then not only a film that concerns politics, but a political film, a work of art that operates as politics and that stands not only as a witness, but mostly as an active agent of history. The first layer of dissensus concerns the very expectation of what we’ve come to know as a Brakhage film: 23rd Psalm Branch is surprisingly topical. While its conclusions and formal allusions are open to different readings, its overarching theme is more clearly defined than in most of the filmmaker’s work. At the same time, the surprise that comes from such clarity is totally in sync with Brakhage’s general ethos: to establish successive patterns to the edge of recognition and then break them, reestablish them, start again as something new… a permanent challenge to the status quo, including its own. The combination of direct clarity (of vision) and unrestrained mobility (of thought) makes the experience of watching 23rd Psalm Branch one of endless richness – something very few films (Kubrick’s 2001: A Space Odyssey; Mario Peixoto’s Limite; Godard’s Adieu au Langage) have managed to achieve. According to P. Adams Sitney ­– quoted in the program notes – 23rd Psalm Branch was made in direct reaction to the Vietnam war. However, the event can only be traced in the film indirectly, working mostly as a trigger for a deeper investigation on more extemporaneous issues, such as war, violence, the process of civilization and the role images play in such a context. Vietnam might be the root of the film, but here it is only the paradoxically unseen tip of the iceberg. There are no easy answers; as usual with Brakhage, the film operates on both a sensory and an intellectual level: the images articulated on screen take hold of the human optical apparatus in order to activate and generate thought. 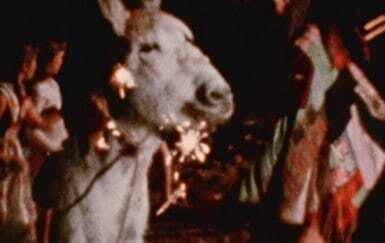 The films of Stan Brakhage require the viewer to think with their whole body. The film is established as a succession of dissensual operations that expand the meaning of the images on screen in multiple ways. It begins with shots of a passing landscape that are interrupted by staccato images of war, most likely taken from newsreels. The operation connects different times through the memory of a place, as if a specific space couldn’t help but carry the memory of everything that’s happened there. It also expands the official nature of journalistic images with the personal handwriting of Brakhage’s own journal-films – the steady close-ups of mouths agape both shake and are shaken by the handheld frenzy that faces the landscape. Blinking blocks of red and brown are interpolated and sometimes juxtaposed with black and white stock footage of death and oppression, adding color to the distanced images of the cadavers and the abstract moving crowd, soaking the earth with the color of blood… but then the images of death contrast with images of birth (an intermittent shot recreates Courbet’s L’origine du monde) and life: while Brakhage handwrites the words “I can’t go on” halfway through the film, familiar shots of the director’s children running on a field or peacefully asleep reconnect the end and the beginning, hell and heaven as two sides of the same coin. The film is a collection of unexpected opportunities for contrast and dialectical clashes – often resorting to actual split-screen compositions, as well as dissolves and other modes of multiple exposures of the film stock – that keep unfolding new layers of the original theme, alert to the deceiving nature of apparent clarity. A film that operates as politics, but also one that operates as philosophy. Explosions melt into peaceful clouds that dissolve again into the vantage point of the cockpit of the bomb-pouring plane; graphic reality blooms out of moments of near-abstraction; bird’s-eye views of a city coexist with still lifes of pebbles and rocks; macro and micropolitics are tied together, as the line between exceptional events and the mundane reality gets lost in the fog; the compositional similarity between the liturgy of religion and the crowds that celebrate fascism are all subsumed in the campfire firecrackers that wrap the film – both biblical and pagan in its symbolism – and find one of its most touching representations in one of its many extremely personal title-cards: “Peter Kubelka’s Vienna” – the same town that was once home for Hitler, Stalin, Trotsky, Tito and Freud is identified here by the way less familiar name of the great Austrian artist, who was one of the director’s closest friends, and who brings along jazz concerts, lively bars and an explosion of warm colors. 23rd Psalm Branch overflows with moments of equal simplicity that generate extraordinary leaps of thought, never settling for the easy way out, refusing to offer the viewer any possibility of comfort: it is both beautiful and disturbing, daring as well as grounded, grand yet touchingly modest. While the imperatives of today represent the daily task of thinking of what to do next, Brakhage’s film’s only answer is that it is perhaps just as important to understand how we got here – to notice the patterns just before they are confirmed, and to foster the creativity to break them… to honor the complexity of the world and to make the work of art itself a demonstration of courage. Dissenting words: a conversation with Jacques Rancière, by Jacques Rancière and David Panagia.